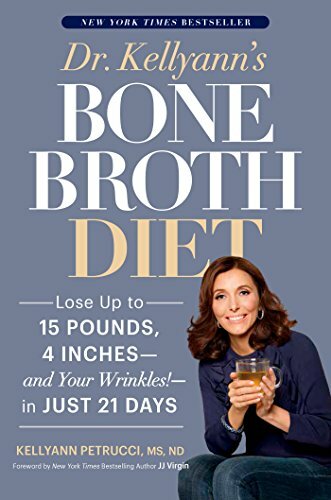 Centered on the newest health craze, Dr. Kellyann's Bone Broth Diet is a twenty-one-day plan to lose up to twenty pounds and see fewer wrinkles. The New York Times says it ranks with green juice and coconut water as the next magic potion in the eternal quest for perfect health. ABC News calls it the new juice craze. Celebrities like Gwyneth Paltrow and Kobe Bryant are hooked on it. It's bone broth-and it's the core of Dr. Kellyann's Bone Broth Diet. Naturopathic physician and weight-loss specialist Kellyann Petrucci knows the healing power of bone broth. The cornerstone of her booming health practice (as well as so many family recipes), bone broth is packed with fat-burning, skin-tightening collagen; has anti-inflammatory properties; helps heal the gut; and warms and satisfies the entire body. 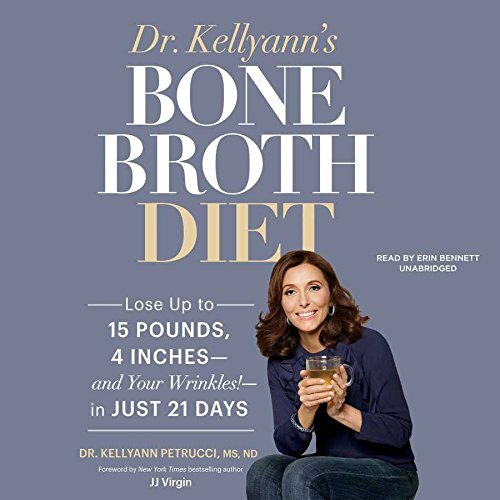 In Dr. Kellyann's Bone Broth Diet, Dr. Petrucci couples delicious bone broth recipes with a groundbreaking intermittent fasting plan, helping you achieve spectacular weight loss and more youthful looking skin in just twenty-one days. Dr. Petrucci walks you through the science of why bone broth works, then arms you with a plan to lose weight safely and easily-with no cravings, weakness, or hunger pains. She'll introduce you to simple but gourmet recipes for beef, turkey, chicken, and fish bone broths and soups that are loaded with flavor and nutrients, and she'll show you easy ways to cut down on time spent in the kitchen. Also incorporating easy resistance training routines and mindfulness meditation exercises, Dr. Petrucci gives you everything you need to succeed. Kellyann Petrucci, MS, ND, is a board-certified naturopathic physician and certified nutrition consultant with a thriving practice in Bucks County, Pennsylvania. She is also a concierge doctor for celebrities in Los Angeles and New York. Petrucci is a regular guest on The Doctors, The Dr. Oz Show, and national news programs and is a regular contributor to the Huffington Post and Mindbodygreen. Dr. Kellyann's Bone Broth Diet is totally dialed in. This is empowering, user-friendly information supported by the most forward-thinking scientific research available. -- "David Perlmutter, MD, #1 NewYork Times bestselling author"
Dr. Kellyann's Bone Broth Diet is a must-read for anyone who wants to say goodbye to old habits and de-age their bodies. The easy-to-follow strategies will rescue you from old patterns and jumpstart your metabolism. Dr. Kellyann's plan will help create the 'glow' that comes from having endless energy, a trim body, and a radiant complexion. -- "Kathy Smith, New York Times bestselling author"
Here's what Kellyann and I know from decades of transforming people's lives: What you put on your fork is more powerful than anything you'll find in a prescription bottle. -- "Mark Hyman, MD, New York Times bestselling author"
Naturopathic physician Petrucci, having prescribed the benefits of a bone-broth diet for more than twenty years, now shares an easy-to-follow plan that, she says, removes the 'pain and fear' from dieting...Without hype, the book outlines a simple, straightforward approach that should get even the most jaded dieter excited.